We fell in love with Singapore. Everything in Singapore is so nice and clean and beautiful. 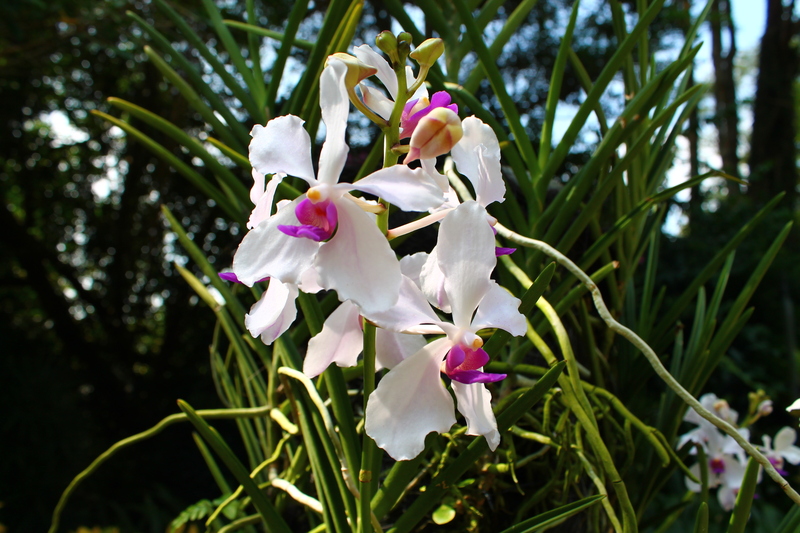 It is a city built right in the middle of a jungle so there are lush gardens, trees, and flowers all around the skyscrapers and busy streets. 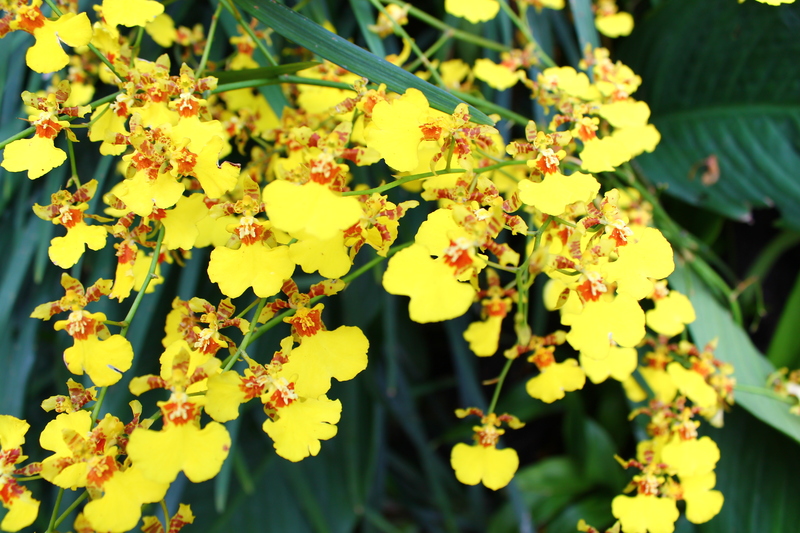 Since it’s a tropical climate, it is green and warm all year round, something we are desperately missing in Korea. 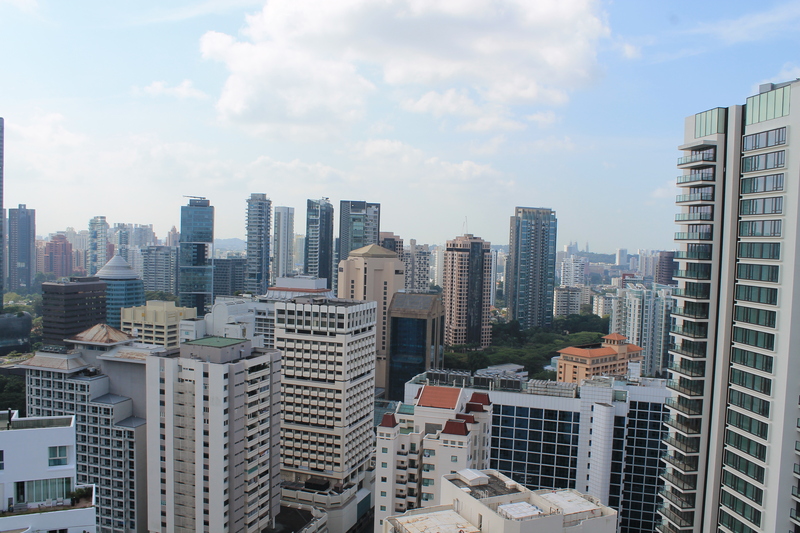 English is the common language in Singapore which made it incredibly easy for us to get around. We found that people here were friendly and very polite. In Korea (and China in our experience) there is more of an “everyman-for-himself” mentality which comes out in the way everyone pushes their way to the front instead of waiting in line for things as well as the lack of personal space. In Singapore, while public transportation could be very crowded, people took care not to actually be touching those around them – and if they did, they immediately apologized. They said, “Excuse me” when they needed to pass instead of just pushing people out of the way. These little things really stood out to us and made us feel that if we ever moved to Asia again, Singapore would be at the top of our list of comfortable places to be. 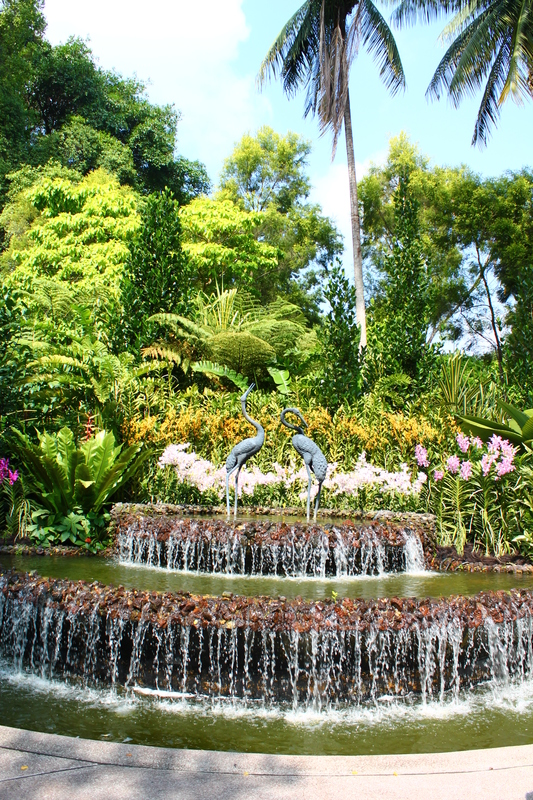 Besides a truly enormous number of shopping malls, Singapore has a lot of other interesting things to do and see. 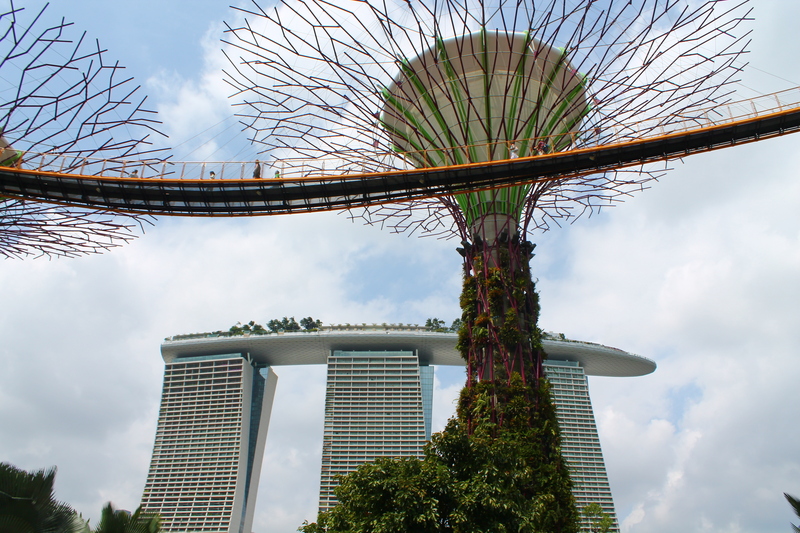 Since the weather is so nice, many sights and activities are geared towards being outdoors.We went to the Botanic Gardens and had lunch at the top of the Marina Bay Sands Hotel – an iconic building overlooking the harbor. The Marina Bay Sands is the three towers with the cruise ship on top of it. Also pictured are the bridge designed to look like a double helix and a museum that looks sort of like a clam shell. Very artsy picture by Jonathan. 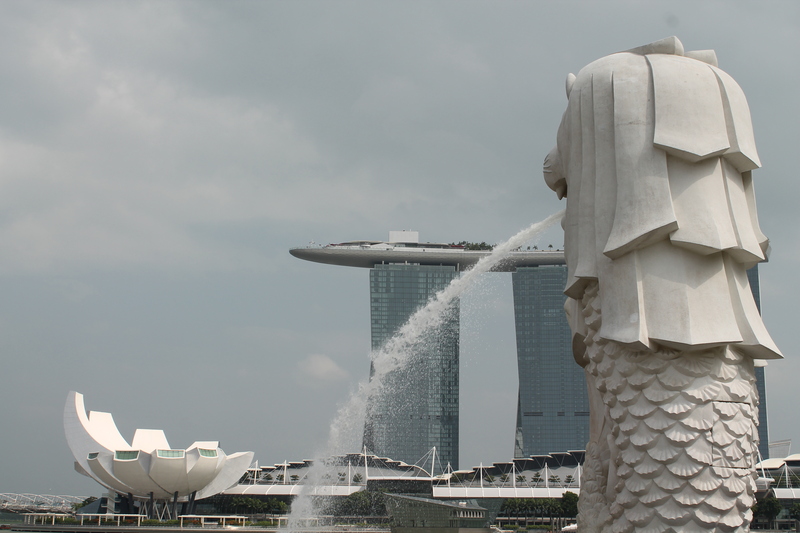 That statue is of, I kid you not, a “merlion,” as in half-mermaid, half-lion. 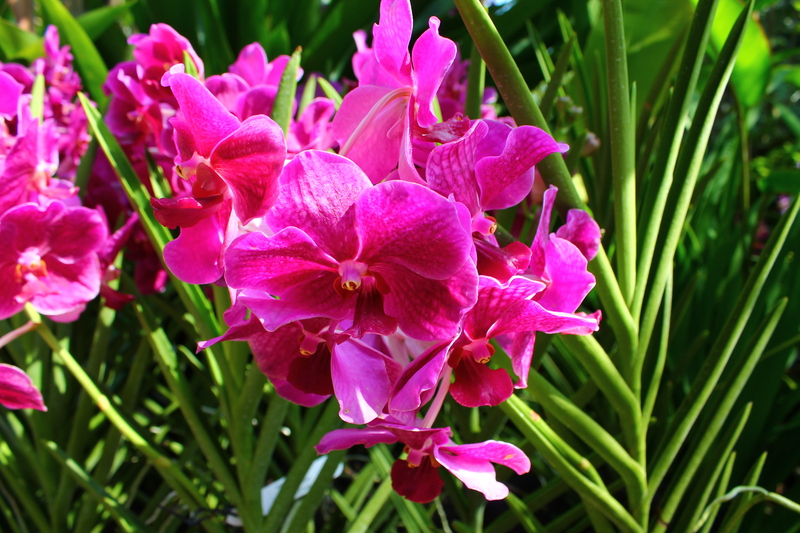 It is the official symbol of Singapore. 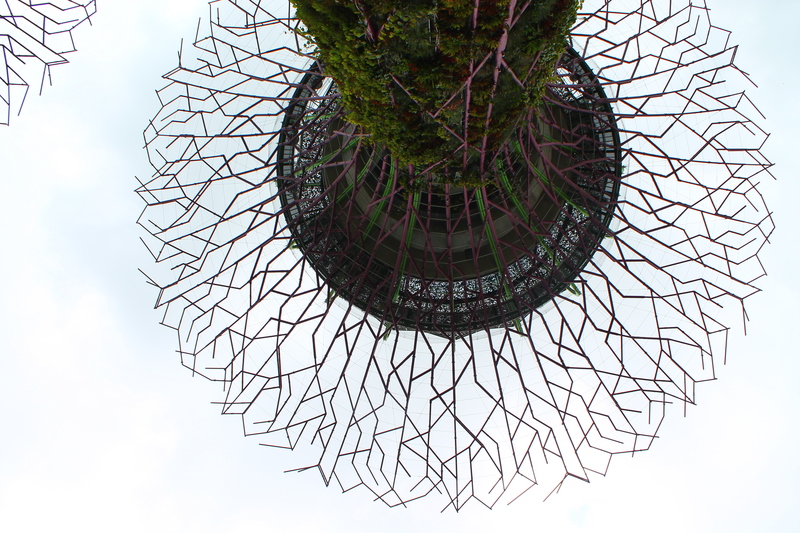 We also went to Gardens by the Bay, super cool man-made gardens that are an interesting mix of plants and flowers and futuristic architectural elements. I think it would look really cool at night when it’s all lit up, but we unfortunately weren’t there for that. 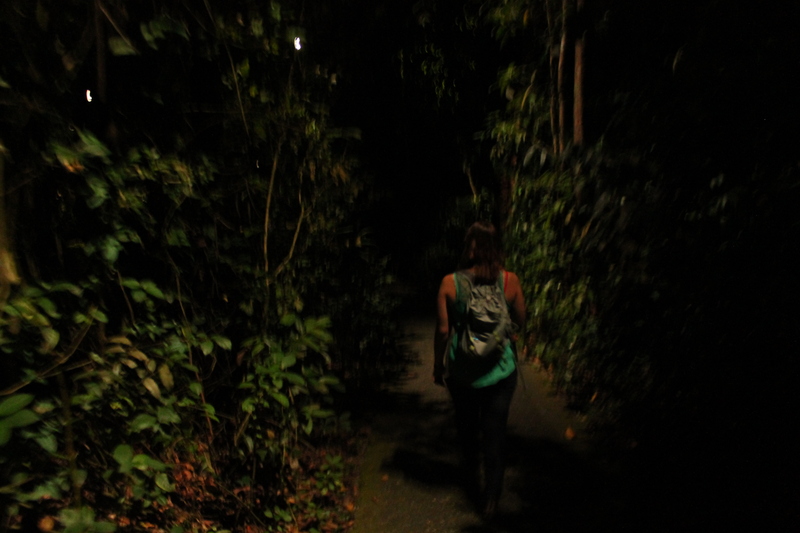 One night we went to Singapore’s Night Zoo – a special zoo that’s only open at night to allow better viewing of the many nocturnal animals at the zoo. 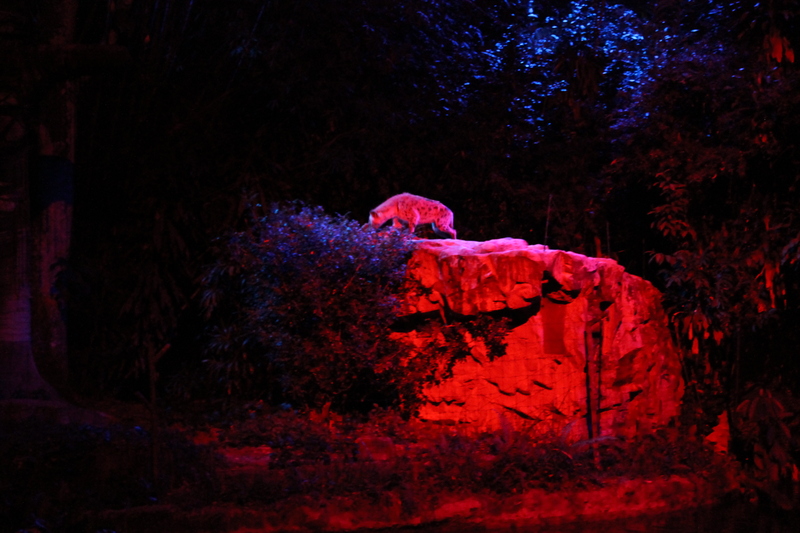 Everything is dark except for some perfectly placed spotlights to help you see the path and to illuminate the animals. It was a unique and fun experience, though not great for taking pictures. Here I am walking down the dimly lit path. The Night Zoo was not good for pictures since you can’t use a flash, but here’s on OK shot of a spotted hyena. 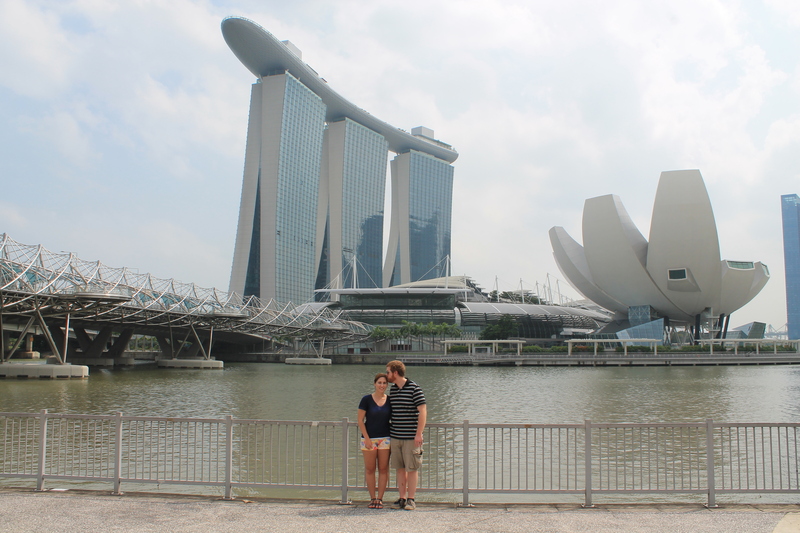 One of the things we loved most about Singapore was how truly international it feels. Singapore’s population is about 5.5 million people with nearly 25% being foreign-born or expats. 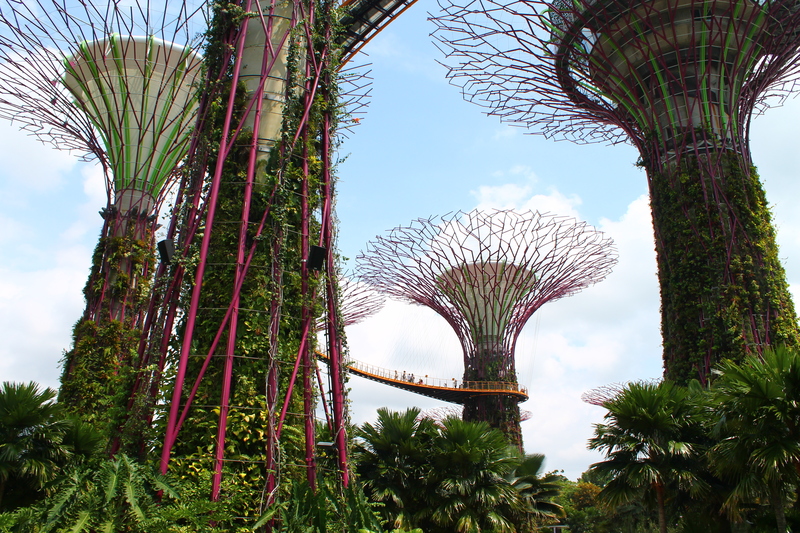 Walking around Singapore felt like walking around New York City – a true melting pot of races, cultures, and religions. The only downside to Singapore is that everything is VERY EXPENSIVE so it was a good thing we were only there for a few days. On Friday night we took a sleeper train across the border into Malaysia. We thought the sleeper train experience might be fun and it was a very cheap way to travel. While it wasn’t great for getting a lot of rest, it was still a fun experience. 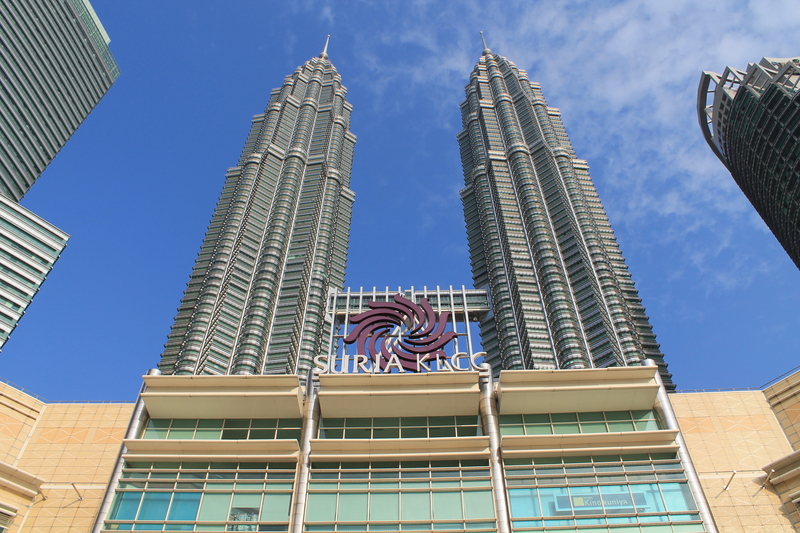 We spent the day on Friday seeing a few things in Kuala Lumpur before heading out to the airport where we flew overnight back to Korea. 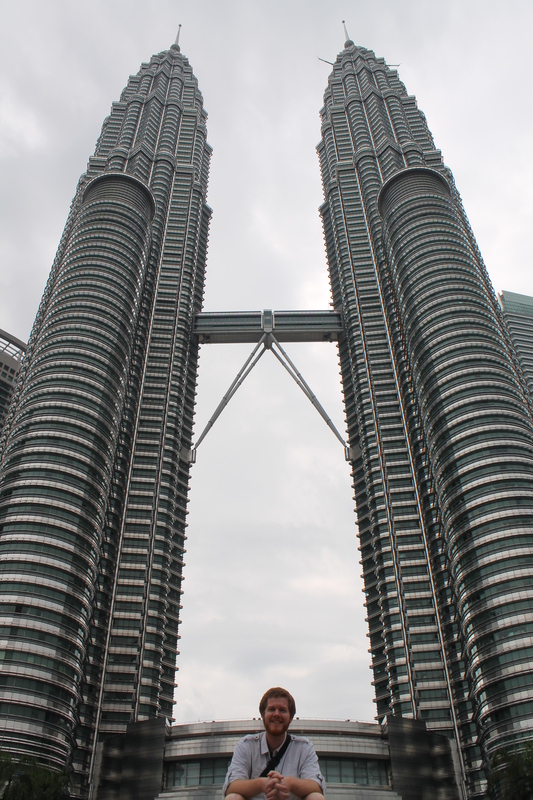 Our general impression of Kuala Lumpur was very positive. Malaysia is a Muslim country which was evident in lots of ways – women wearing head coverings of course, but also things like signs in the subway saying “No Smoking,” “No Littering,” and “No Indecent Behavior” with a picture of a man and woman kissing. 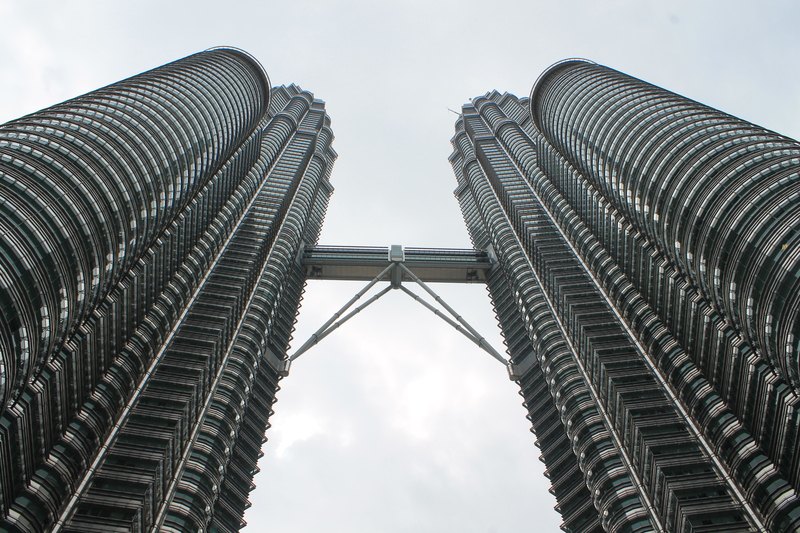 While we were only there a short time, the people in Kuala Lumpur were probably the friendliest we met on our travels – even strangers smiled at us if they made eye contact and everyone we interacted with was very polite, helpful, and welcoming. It would have been great to have more time there, but we were thankful that we at least got to spend the day. The Patronus Towers. Apparently these were the tallest buildings in the world until 2004. 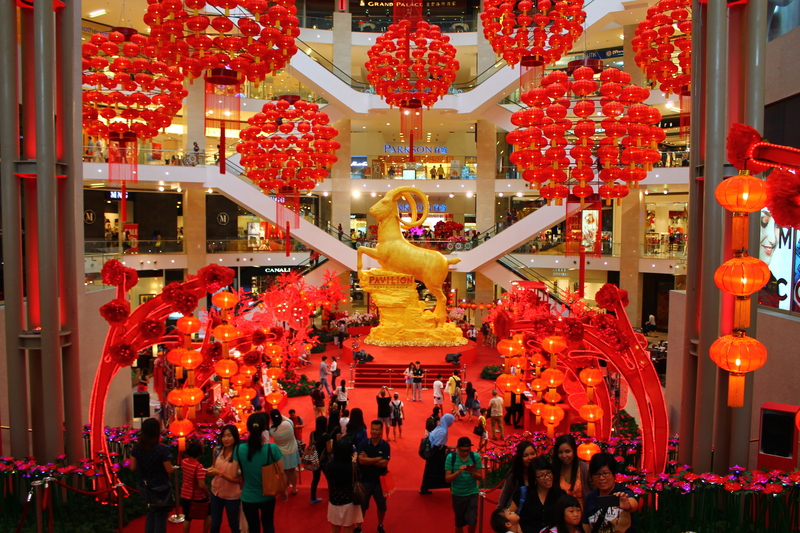 Elaborate Chinese New Year display inside one of the huge shopping malls in Kuala Lumpur. Today was my first day back at work and next week’s post will start the real challenge – finding adventures in my everyday life. It’s easy to feel adventurous while traveling, but it’s much harder when you are back to the rhythms of ordinary life. By the way, here are some of my favorite adventures from the posts you’ve shared over the past few weeks. Check them out! Brenda decides to join a small-group (just loved how honest this one was – I can relate so well to that feeling that everyone else has it all together). I’m a Singaporean and I’m so glad you enjoyed it here 🙂 Wish you all the best for your future travels! Thank you! I really enjoyed our time there. Sadly, I didn’t see James Bond or Harry Potter. 😦 But we still had a great time, haha. I think Singapore in particular is really impressive be being a relatively small country crammed with people of different races, cultures, and religions who all seem to coexist pretty peacefully. So fun! These are two more places that I have been. 🙂 I LOVE Singapore. I actually tried to convince Steven to move there a couple of years ago. It’s such a great place. I went to KL in high school for a forensics (as in speech/debate/drama) competition. It was lovely. I stayed with a wonderful family while I was there. It was during Ramadan, so they waited to eat until the sun had gone down, but I remember they left out food for me in the morning and afternoon. They were so great. It sounds like you had a great trip!! And I wonder if I could have used the word great ONE more time in that paragraph . . . duh. 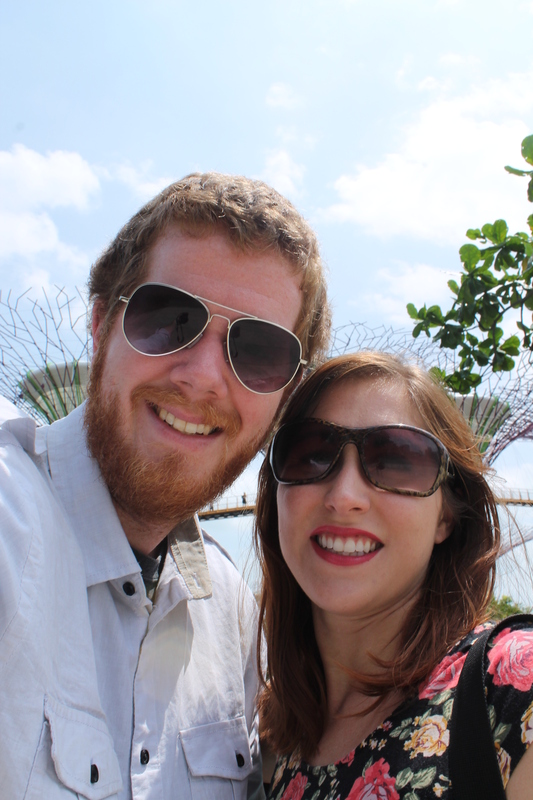 We certainly enjoyed Singapore! I’m sympathetic to your fear of flying – I actually really don’t like it either. I have to read or do something to distract myself the whole time because it makes me very nervous and very uncomfortable. My ankles swell up and my eyes get super irritated and itchy even on really short flights. 😦 So glad you made it to New Zealand! It is my favorite place in the world! Haha, that sounds helpful. Five weeks in New Zealand would be amazing! I was only there for 1 week and it still left such an impression. I would love to go back and do a driving trip all around the south island. What an unbelievably beautiful place! 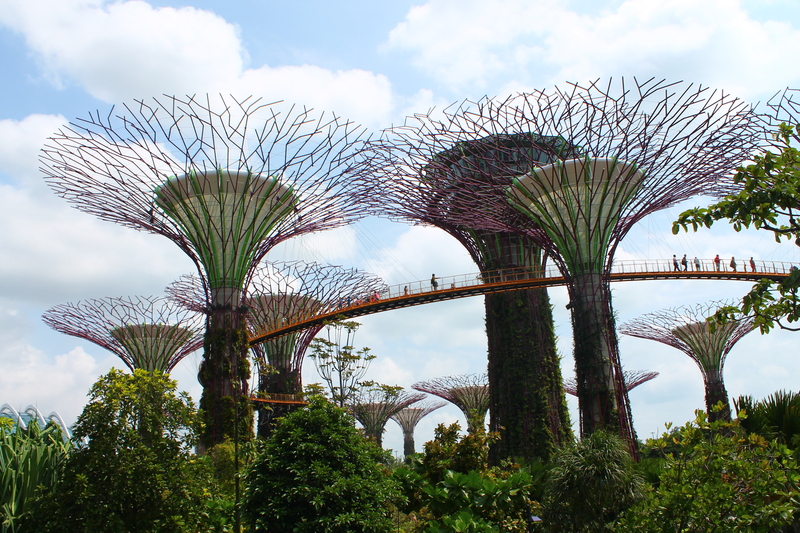 I loved that Garden by the Bay. Did you guys get to walk the bridge I saw in those pictures? We didn’t because it was a separate ticket you had to purchase to go up there and by this point we were on the second to last day of our trip and were running out of money, haha. It’s really cool-looking though, isn’t it? Yes it was very cool looking, but at least you guys got to see the garden.